Dozens of local players, including seven Republic FC Academy players, sign National Letters of Intent during Signing Day. 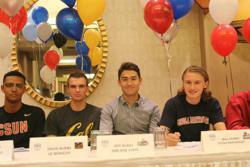 SACRAMENTO, Calif. – National Signing Day marks the first day soccer players from the Class of 2016 may sign their letters of intent and announce their college commitments. Dozens of players throughout the Sacramento region announced commitments today, including seven Sacramento Republic FC Academy players, who signed letters of intent in preparation to continue their soccer careers at the college level. Republic FC’s Academy players committed to a broad range of universities across California all of which compete in NCAA Division I men’s soccer. Defenders David Burns, Mackenzie Harrington, Samuel Dadzie and Nabilai Kibunguchy have committed to Cal, Sacramento State, Cal State Northridge and UC Davis, respectively. Midfielder Will DuBay committed to Loyola Marymount University, while fellow midfielder Jeff Dukes committed to San Jose State. The lone forward in the group, Joseph Restani, has committed to Saint Mary’s College. National Signing Day marks an important step in many high school athletes’ lives as they choose the program for not only their athletic career, but also their education. “With a college education, there’s always a backup plan…With college, you can still get better, and you can still go pro afterwards,” said Burns to the Sacramento Bee in a recent article. The Sacramento region is a hotbed for youth soccer and Republic FC’s academy is not the only program in the area with athletes signing letters of intent. Placer United, San Juan Soccer Academy, FC Elk Grove, Davis Legacy, Sacramento United and many other soccer clubs in the area collectively had dozens of players commit to play at various university programs across the country on Wednesday. Sacramento Republic FC will recognize boys and girls from the Sacramento region who signed letters of intent this past week at their MLS friendly match against the San Jose Earthquakes on Saturday, Feb. 20. Players interested in participating are asked to contact the club by Friday, Feb. 12 at community@sacrepublicfc.com or (916) 307-6100. Aside from youth soccer, the Sacramento area has produced many talented players now playing professionally across the nation. Just last month, Roseville native Madalyn Schiffel was drafted to NWSL team Washington Spirit. She played youth soccer with Placer United and was coached by Republic FC Academy Goalkeepeing Director Gene DuChateau before playing at the University of San Francisco. Schiffel also played for local WPSL club California Storm, a club that USWNT team standout Alex Morgan also played on during her collegiate years. For the men, Granite Bay native Tyler Thompson was drafted to the San Jose Earthquakes after playing collegiately at Stanford University. Thompson is the older brother of Quakes midfielder Tommy Thompson. Ultimately, Republic FC’s goals for the Academy is to produce homegrown players that will play for the club’s first team and the U.S. National Team, but with seven players committing to colleges, the Academy understands and values developing not just quality players, but well-educated and quality people. Signing Day marks the beginning of the period players can official sign letters of intent and commit to programs. Additional members of the Class of 2016 throughout the region will continue to commit to programs through the summer.